Welcome to Armor Venue, home of one of the largest collections of Medieval Armor, Helmets, Shields, Renaissance clothing, and much more. Looking for Roman Lorica Segmentata armor, knight's armor, or medieval shields? We have it all. We carry products manufactured from around the world, including here in the US, Italy, Spain, India, and China. We carry brands from Deepeeka, Legacy Arms, Denix, Cas Hanwei and many more. Our armor and clothing are designed to the highest levels of quality to ensure that you receive the most realistic and accurate products. Take a look at our Roman Centurion Helmet or medieval gothic breastplate to see what we're talking about. At Armor Venue we strive to provide the latest line of products and are constantly updating our website with new ones, some from newly added manufacturers. Some our frequently updated products include medieval breastplates, and the Halloween Specials which carries significantly reduced price items. Please take some time to browse the many categories on the site. To get the latest updates on our website, contests and sweepstakes as well as special limited time offer coupons please visit our Facebook page. Visit the Armor Venue Official Blog often as we post there regularly! We go in-depth on different products, research historical armor, and post news and updates as well. We also keep a Google Plus Page for our website as well. If you have any questions send us an email at support@armorvenue.com. Your feedback is important to us, so don't hesitate to send us an email with any of your comments. Check Out Some of Our Most Popular Best-Selling Armor and Helmets! 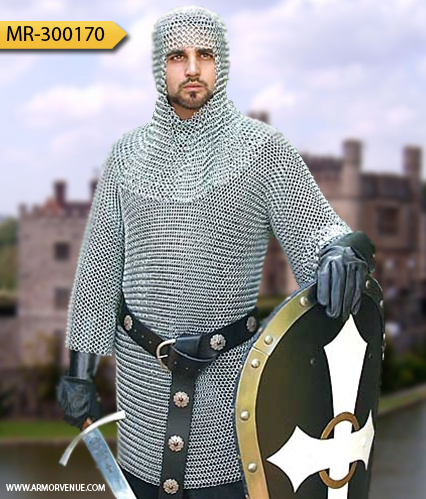 Chainmail Armor - Save up to 35% off retail price with complete line of chainmail armor! Armor Venue strives to be chainmail experts by carrying butted to riveted chainmail. Most of our pieces are galvanized steel meaning less maintenance for you. Go check out our Plate Armor and Chainmail Maintenance page for more tips!